Connect with McDougall | Dr. McDougall's Health & Medical Center Dr. McDougall's Online Discussion Board • View topic - Exercise, Health & You: How Much Is Enough? NOTE: We are updating and reorganizing the forums. This is the place to learn about the McDougall program and get support in following the program. Exercise, Health & You: How Much Is Enough? A place to get your questions answered from McDougall staff dietitian, Jeff Novick, MS, RDN. Re: Exercise, Health & You: How Much Is Enough? "Those who met the guidelines precisely, completing 150 minutes per week of moderate exercise, enjoyed greater longevity benefits and 31 percent less risk of dying during the 14-year period compared with those who never exercised. The sweet spot for exercise benefits, however, came among those who tripled the recommended level of exercise, working out moderately, mostly by walking, for 450 minutes per week, or a little more than an hour per day. Those people were 39 percent less likely to die prematurely than people who never exercised." NOTE: Going from zero to 150 minutes gets you a 31% benefit. Going from 150-450 minutes gets you a 39% benefit. So, for 3x the effort (150-450 minutes per week) they got only a "modest" 8% more benefit. Breaking it down, for 150 minutes, your benefit is .26 per minute. At 450 minutes, your benefit is .086 per minute. For the extra 300 minutes, your benefit is .026 per minute. 1) Leisure Time Physical Activity and Mortality: A Detailed Pooled Analysis of the Dose-Response Relationship. JAMA Intern Med. 2015 Apr 6. doi: 10.1001/jamainternmed.2015.0533. The 2008 Physical Activity Guidelines for Americans recommended a minimum of 75 vigorous-intensity or 150 moderate-intensity minutes per week (7.5 metabolic-equivalent hours per week) of aerobic activity for substantial health benefit and suggested additional benefits by doing more than double this amount. However, the upper limit of longevity benefit or possible harm with more physical activity is unclear. To quantify the dose-response association between leisure time physical activity and mortality and define the upper limit of benefit or harm associated with increased levels of physical activity. We pooled data from 6 studies in the National Cancer Institute Cohort Consortium (baseline 1992-2003). Population-based prospective cohorts in the United States and Europe with self-reported physical activity were analyzed in 2014. A total of 661 137 men and women (median age, 62 years; range, 21-98 years) and 116 686 deaths were included. We used Cox proportional hazards regression with cohort stratification to generate multivariable-adjusted hazard ratios (HRs) and 95% CIs. Median follow-up time was 14.2 years. Leisure time moderate- to vigorous-intensity physical activity. The upper limit of mortality benefit from high levels of leisure time physical activity. Compared with individuals reporting no leisure time physical activity, we observed a 20% lower mortality risk among those performing less than the recommended minimum of 7.5 metabolic-equivalent hours per week (HR, 0.80 [95% CI, 0.78-0.82]), a 31% lower risk at 1 to 2 times the recommended minimum (HR, 0.69 [95% CI, 0.67-0.70]), and a 37% lower risk at 2 to 3 times the minimum (HR, 0.63 [95% CI, 0.62-0.65]). An upper threshold for mortality benefit occurred at 3 to 5 times the physical activity recommendation (HR, 0.61 [95% CI, 0.59-0.62]); however, compared with the recommended minimum, the additional benefit was modest (31% vs 39%). There was no evidence of harm at 10 or more times the recommended minimum (HR, 0.69 [95% CI, 0.59-0.78]). A similar dose-response relationship was observed for mortality due to cardiovascular disease and to cancer. Meeting the 2008 Physical Activity Guidelines for Americans minimum by either moderate- or vigorous-intensity activities was associated with nearly the maximum longevity benefit. We observed a benefit threshold at approximately 3 to 5 times the recommended leisure time physical activity minimum and no excess risk at 10 or more times the minimum. In regard to mortality, health care professionals should encourage inactive adults to perform leisure time physical activity and do not need to discourage adults who already participate in high-activity levels. Few studies have examined how different proportions of moderate and vigorous physical activity affect health outcomes. To examine whether the proportion of total moderate to vigorous activity (MVPA) that is achieved through vigorous activity is associated with all-cause mortality independently of the total amount of MVPA. We performed a prospective cohort study with activity data linked to all-cause mortality data from February 1, 2006, through June 15, 2014, in 204 542 adults aged 45 through 75 years from the 45 and Up population-based cohort study from New South Wales, Australia (mean [SD] follow-up, 6.52 [1.23] years). Associations between different contributions of vigorous activity to total MVPA and mortality were examined using Cox proportional hazards models, adjusted for total MVPA and sociodemographic and health covariates. Different proportions of total MVPA as vigorous activity. Physical activity was measured with the Active Australia Survey. All-cause mortality during the follow-up period. During 1 444 927 person-years of follow-up, 7435 deaths were registered. Compared with those who reported no MVPA (crude death rate, 8.34%), the adjusted hazard ratios for all-cause mortality were 0.66 (95% CI, 0.61-0.71; crude death rate, 4.81%), 0.53 (95% CI, 0.48-0.57; crude death rate, 3.17%), and 0.46 (95% CI, 0.43-0.49; crude death rate, 2.64%) for reporting 10 through 149, 150 through 299, and 300 min/wk or more of activity, respectively. Among those who reported any MVPA, the proportion of vigorous activity revealed an inverse dose-response relationship with all-cause mortality: compared with those reporting no vigorous activity (crude death rate, 3.84%) the fully adjusted hazard ratio was 0.91 (95% CI, 0.84-0.98; crude death rate, 2.35%) in those who reported some vigorous activity (but <30% of total activity) and 0.87 (95% CI, 0.81-0.93; crude death rate, 2.08%) among those who reported 30% or more of activity as vigorous. These associations were consistent in men and women, across categories of body mass index and volume of MVPA, and in those with and without existing cardiovascular disease or diabetes mellitus. Among people reporting any activity, there was an inverse dose-response relationship between proportion of vigorous activity and mortality. Our findings suggest that vigorous activities should be endorsed in clinical and public health activity guidelines to maximize the population benefits of physical activity. To put these in perspective, you can see the formal definitions of moderate and moderate to vigorous activity here.. While these articles may sound like they are supporting "intense" exercise, the levels in the study were no where near the level of activity that the extreme/intense exercisers are doing. These articles are 100% in line with the general recommendations linked to in the first post of this thread, 150-300 per week of moderate activity or 75-150 minutes per week of vigorous activity or a combination of both. JeffN wrote: Here are two other concepts that I have discussed in this forum before, that can really help people in meeting the minimum requirements. They will provide enormous benefit with little to no risk and do not take a lot of time or effort. This is defined as little movements throughout the day such as fidgeting, tapping, standing instead of sitting, crossing one legs, etc. They have found these can add up and can account for upwards of 300 calories a day or more. Arteriosclerosis, Thrombosis, and Vascular Biology. These are the messages that have to get out to the public as they will provide enormous benefit with little to no risk and do not take a lot of time or effort and are 100% inline with our overall message. Villablanca, Pedro A. et al. Obesity is linked to cardiovascular disease. The global increase in sedentary lifestyle is an important factor contributing to the rising prevalence of the obesity epidemic. Traditionally, counseling has focused on moderate- to vigorous-intensity exercise, with disappointing results. Nonexercise activity thermogenesis (NEAT) is an important component of daily energy expenditure. It represents the common daily activities, such as fidgeting, walking, and standing. These high-effect NEAT movements could result in up to an extra 2000 kcal of expenditure per day beyond the basal metabolic rate, depending on body weight and level of activity. Implementing NEAT during leisure-time and occupational activities could be essential to maintaining a negative energy balance. NEAT can be applied by being upright, ambulating, and redesigning workplace and leisure-time environments to promote NEAT. The benefits of NEAT include not only the extra calories expended but also the reduced occurrence of the metabolic syndrome, cardiovascular events, and all-cause mortality. We believe that to overcome the obesity epidemic and its adverse cardiovascular consequences, NEAT should be part of the current medical recommendations. The content of this review is based on a literature search of PubMed and the Google search engine between January 1, 1960, and October 1, 2014, using the search terms physical activity, obesity, energy expenditure, nonexercise activity thermogenesis, and NEAT. ▪A significant decrease in physical activity has contributed to the obesity pandemic. Complemented with moderate- to vigorous-intensity exercise activity, nonexercise activity thermogenesis (NEAT) seems to have a fundamental role in preventing and reducing the obesity pandemic. ▪NEAT includes a series of continuous and vital movements that do not involve moderate- to vigorous-intensity exercise. These additive activities account for significant thermogenesis and energy consumption. ▪NEAT variability can explain the caloric expenditure differences in individuals with similar phenotypes. Variances in work and leisure-time activities in individuals play a fundamental role in NEAT differences. ▪By just doing simple daily manual task activities, NEAT can be enhanced throughout the workday and at home. These activities should be encouraged in childhood and continued during adulthood. ▪NEAT decreases cardiovascular disease mortality and improves metabolic parameters. NEAT has good long-term adherence, with positive impact. Researchers have discovered that extreme exercise can cause intestinal bacteria to leak into the bloodstream, leading to blood poisoning. Experts at Monash University monitored people participating in a range of extreme endurance events, including 24-hour ultra-marathons and multi-stage ultra-marathons, run on consecutive days. "Blood samples taken before and after the events, compared with a control group, proved that exercise over a prolonged period of time causes the gut wall to change, allowing the naturally present bacteria, known as endotoxins, in the gut to leak into the bloodstream. This then triggers a systemic inflammatory response from the body's immune cells, similar to a serious infection episode. Increased Circulating Anti-inflammatory Cells in Marathon-trained Runners. Exercise training can alter immune function. Marathon training has been associated with an increased susceptibility to infectious diseases and an increased activity of inflammatory-based diseases, but the precise mechanisms are unknown. The purpose of this study was to compare levels of circulating CD4 (+) T cell subsets in the periphery of marathon-trained runners and matched non-marathon controls. 19 recreational marathoners that were 4 weeks from running a marathon and 19 demographically-matched healthy control subjects had the percentage of CD4 (+) T cell subpopulations (T helper 1, T helper 2, T helper 1/T helper 2 ratio, regulatory T cells, CD4(+)IL10(+), and CD4(+)TGFβ(+) (Transforming Growth Factor-beta) measured by flow cytometry. Marathon-trained runners had significantly less T helper 1 and regulatory T cells and significantly more T helper 2, CD4 (+) IL10 (+) , and TGFβ (+) cells than the control subjects. The alterations in the percentage of T helper 1 and T helper 2 cells led to a significantly lower T helper 1/T helper 2 ratio in the marathon-trained runners. These data suggest that endurance-based training can increase the number of anti-inflammatory cells. This may be a potential mechanism for the increased incidence of both infectious and inflammatory diseases observed in endurance athletes. JeffN wrote: We can also look at the issue another way, which I have discussed many times before. Let us say we have two identical people. - one maintains a BMI of 18.5 and does so through a very healthy diet. They exercise moderately about 30 minutes a day, 5x a week and burn a total of about 2000 calories per day. To maintain their BMI, they consume about 2000 calories per day. - the other identical person also maintains a BMI of 18.5 and does so through a very healthy diet. However, they exercise vigorously about 1.5 - 2 hours a day (or more) and burn a total of about 3000-3500 calories per day. To maintain their BMI, they consume about 3000-3500 calories per day. All the studies in animals and the recent ones in humans show the first one will do much better and live longer and healthier. Remember, a little is good, a little more may be a little better, but not that much and lots more is not good. Six-month Calorie Restriction in Overweight Individuals Elicits Transcriptomic Response in Subcutaneous Adipose Tissue That is Distinct From Effects of Energy Deficit. Lam YY, Ghosh S, Civitarese AE, Ravussin E.
Calorie restriction confers health benefits distinct from energy deficit by exercise. We characterized the adipose-transcriptome to investigate the molecular basis of the differential phenotypic responses. Abdominal subcutaneous fat was collected from 24 overweight participants randomized in three groups (N = 8/group): weight maintenance (control), 25% energy deficit by calorie restriction alone (CR), and 25% energy deficit by calorie restriction with structured exercise (CREX). Within each group, gene expression was compared between 6 months and baseline with cutoffs at nominal p </= .01 and absolute fold-change =/> 1.5. Gene-set enrichment analysis (false discovery rate < 5%) was used to identify significantly regulated biological pathways. CR and CREX elicited similar overall clinical response to energy deficit and a comparable reduction in gene transcription specific to oxidative phosphorylation and proteasome function. CR vastly outweighed CREX in the number of differentially regulated genes (88 vs 39) and pathways (28 vs 6). CR specifically downregulated the chemokine signaling-related pathways. Among the CR-regulated genes, 27 functioned as transcription/translation regulators (eg, mRNA processing or transcription/translation initiation), whereas CREX regulated only one gene in this category. Our data suggest that CR has a broader effect on the transcriptome compared with CREX which may mediate its specific impact on delaying primary aging. As an FYI, this study deals in METs. The general recommendations I reference in the original post, are designed to provide about 10-20 METs per week for the 30-60 minutes per day, most days, which this study points out (see highlighted text). - Adults aged 18–64 should do at least 150 minutes of moderate-intensity aerobic physical activity throughout the week or do at least 75 minutes of vigorous-intensity aerobic physical activity throughout the week or an equivalent combination of moderate- and vigorous-intensity activity. - Aerobic activity should be performed in bouts of at least 10 minutes duration. - For additional health benefits, adults should increase their moderate-intensity aerobic physical activity to 300 minutes per week, or engage in 150 minutes of vigorous-intensity aerobic physical activity per week, or an equivalent combination of moderate- and vigorous-intensity activity. - Muscle-strengthening activities should be done involving major muscle groups on 2 or more days a week. Leisure time physical activity and cancer risk: evaluation of the WHO's recommendation based on 126 high-quality epidemiological studies. Liu L, Shi Y, Li T, Qin Q, Yin J, Pang S, Nie S, Wei S.
The WHO has concluded that physical activity reduces the risk of numerous diseases. However, few systemic reviews have been performed to assess the role of leisure time physical activity (LTPA) in lowering the risk of cancer in a dose-dependent manner and furthermore the suitability of recommendation of physical activity by the WHO. A systematic review and meta-analysis was designed to estimate cancer risk by LTPA in binary comparison and in a dose-dependent manner. MEDLINE and Web of Science were searched up to 30 December 2014 without language restrictions. Reference lists were reviewed for potential articles. A total of 126 studies were recruited into the meta-analysis. Overall, the total cancer risk was reduced by 10% in people who undertook the most LTPA as compared with those who did the least. Dose-response meta-analysis indicated that the current WHO recommendation (equal to an average of 10 metabolic equivalents of energy hours per week) induced a 7% (95% CI 5% to 9%) cancer reduction. Moreover, the protective role of LTPA against cancer becomes saturated at 20 metabolic equivalents of energy hours per week, with a relative risk of 0.91 (95% CI 0.88 to 0.93). Subanalyses results based on cancer types showed that LTPA only exhibited significant protection against breast cancer and colorectal cancer. Our meta-analysis indicates that the current WHO recommendation of physical activity can result in a 7% reduction in cancer risk, which is mainly attributed to its protective role against breast cancer and colorectal cancer. Furthermore, two-fold of current recommendation level is considered to give its saturated protection against cancer. In 2008, the U.S. federal government issued fully approved physical activity guidelines for the first time. The idea that physical activity impacts health can be traced as far back as Hippocrates, and the science around the linkages between physical activity and health has continuously accumulated. On April 14-15, 2015, the Institute of Medicine?s Roundtable on Obesity Solutions held a 2-day workshop to explore the state of the science regarding the impact of physical activity in the prevention and treatment of overweight and obesity and to highlight innovative strategies for promoting physical activity across different segments of the population. This report summarizes the presentations and discussions from this workshop. Interestingly, the authors of this paper include Steven N. Blair, from the Cooper Clinic, and James H. O'Keefe, MD, who has authored many of the papers in this thread about the negative impact of too much running. 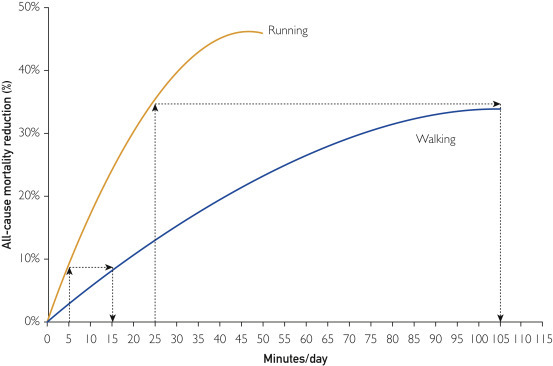 Effects of Running on Chronic Diseases and Cardiovascular and All-Cause Mortality. Mayo Clin Proc. 2015 Nov;90(11):1541-52. Considerable evidence has established the link between high levels of physical activity (PA) and all-cause and cardiovascular disease (CVD)-specific mortality. Running is a popular form of vigorous PA that has been associated with better overall survival, but there is debate about the dose-response relationship between running and CVD and all-cause survival. In this review, we specifically reviewed studies published in PubMed since 2000 that included at least 500 runners and 5-year follow-up so as to analyze the relationship between vigorous aerobic PA, specifically running, and major health consequences, especially CVD and all-cause mortality. We also made recommendations on the optimal dose of running associated with protection against CVD and premature mortality, as well as briefly discuss the potential cardiotoxicity of a high dose of aerobic exercise, including running (eg, marathons). FIGURE 6. A 5-minute run generates the same benefits as a 15-minute walk, and a 25-minute run is equivalent to a 105-minute walk. Q ; How many weekly miles should I run to improve my health? A; Surprisingly few, it seems. According to a new review of studies related to running and health, jogging for as few as five or six miles per week could substantially improve someone’s health. The reviewers found that even with such skimpy mileage, runners generally weighed less and had a lower risk of obesity than people who jogged fewer than five miles per week or (more commonly) not at all. These runners also were less likely to experience high blood pressure, cholesterol problems, diabetes, strokes, certain cancers and arthritis than the barely- or nonrunners. “It seems like the maximum benefits of running occur at quite low doses,” said Dr. Carl J. Lavie, medical director of cardiac rehabilitation and prevention at the Ochsner Medical Center in New Orleans and lead author of the review, which was published in September in Mayo Clinic Proceedings. As little as “one to two runs per week, or three to six miles per week, and well less than an hour per week” can be quite beneficial, he said. Someone hoping to become a better, faster runner also would need to run more than five or six miles a week, he said. However, there may be an upper limit to the desirable mileage if your primary goal is improved health. Some evidence, he said, suggested that running strenuously for more than about an hour every day could slightly increase someone’s risks for heart problems, as well as for running-related injuries and disabilities. Radboud University Medical Center, Department of Physiology, Nijmegen, the Netherlands. Division of Cardiology, Hartford Hospital, Hartford, Connecticut. There is no known upper limit for moderate-intensity physical activity in healthy individuals, but doses more than 100 minutes a day do not appear to be associated with additional reductions in mortality rates.5 For vigorous physical activity, low doses are related to large benefits, whereas doses up to 10 times the recom- mended physical activity levels are not associated with further reductions in mortality rates5-7. Some studies suggest an attenua- tion of health benefits at higher physical activity doses, but meth- odological flaws may limit the validity of these observations.1,4 No dose of vigorous physical activity is associated with higher mortal- ity rates than physical inactivity. Physical activity is one of the best modifiable factors for the prevention of noncommunicable dis- eases and mortality, so it is important for clinicians to keep empha- sizing that exercise is medicine. Are There Deleterious Cardiac Effects of Acute and Chronic Endurance Exercise? Eijsvogels TM, et al. Physiol Rev. 2016. Multiple epidemiological studies document that habitual physical activity reduces the risk of atherosclerotic cardiovascular disease (ASCVD), and most demonstrate progressively lower rates of ASCVD with progressively more physical activity. Few studies have included individuals performing high-intensity, lifelong endurance exercise, however, and recent reports suggest that prodigious amounts of exercise may increase markers for, and even the incidence of, cardiovascular disease. This review examines the evidence that extremes of endurance exercise may increase cardiovascular disease risk by reviewing the causes and incidence of exercise-related cardiac events, and the acute effects of exercise on cardiovascular function, the effect of exercise on cardiac biomarkers, including "myocardial" creatine kinase, cardiac troponins, and cardiac natriuretic peptides. This review also examines the effect of exercise on coronary atherosclerosis and calcification, the frequency of atrial fibrillation in aging athletes, and the possibility that exercise may be deleterious in individuals genetically predisposed to such cardiac abnormalities as long QT syndrome, right ventricular cardiomyopathy, and hypertrophic cardiomyopathy. This review is to our knowledge unique because it addresses all known potentially adverse cardiovascular effects of endurance exercise. The best evidence remains that physical activity and exercise training benefit the population, but it is possible that prolonged exercise and exercise training can adversely affect cardiac function in some individuals. This hypothesis warrants further examination. The big news is nothing new. No need to reinvent the wheel. There is a direct relationship between chronically elevated cholesterol levels (dyslipidaemia) and cor- onary heart disease. A reduction in total cholesterol is considered the gold standard in preventative cardiovascular medicine. Exercise has been shown to have positive impacts on the pathogenesis, symptomatology and physical fitness of individuals with dyslipidaemia, and to reduce cholesterol levels. The optimal mode, frequency, intensity and duration of exercise for improvement of cholesterol levels are, however, yet to be identified. This review assesses the evidence from 13 published investigations and two review articles that have addressed the effects of aerobic exercise, resistance training and combined aerobic and resistance training on cholesterol levels and the lipid profile. The data included in this review confirm the beneficial effects of regular activity on cholesterol levels and describe the impacts of differing volumes and intensities of exercise upon different types of cholesterol. Evidence-based exercise recommendations are presented, aimed at facilitating the prescription and delivery of interventions in order to optimize cholesterol levels. All adults should avoid inactivity. Some physical activity is better than none, and adults who participate in any amount of physical activity gain some health benefits. For substantial health benefits, adults should do at least 150 minutes (2 hours and 30 minutes) a week of moderate-intensity, or 75 minutes (1 hour and 15 minutes) a week of vigorous-intensity aerobic physical activity, or an equivalent combination of moderate- and vigorous-intensity aerobic activity. Aerobic activity should be performed in episodes of at least 10 minutes, and preferably, it should be spread throughout the week. For additional and more extensive health benefits, adults should increase their aerobic physical activity to 300 minutes (5 hours) a week of moderate-intensity, or 150 minutes a week of vigorous-intensity aerobic physical activity, or an equivalent combination of moderate- and vigorous-intensity activity. Additional health benefits are gained by engaging in physical activity beyond this amount. Adults should also include muscle-strengthening activities that involve all major muscle groups on 2 or more days a week. Older adults should follow the adult guidelines. When older adults cannot meet the adult guidelines, they should be as physically active as their abilities and conditions will allow. Older adults should do exercises that maintain or improve balance if they are at risk of falling. a Moderate-intensity physical activity: Aerobic activity that increases a person’s heart rate and breathing to some extent. On a scale relative to a person’s capacity, moderate-intensity activity is usually a 5 or 6 on a 0 to 10 scale. Brisk walking, dancing, swimming, or bicycling on a level terrain are examples. b Vigorous-intensity physical activity: Aerobic activity that greatly increases a person’s heart rate and breathing. On a scale relative to a person’s capacity, vigorous-intensity activity is usually a 7 or 8 on a 0 to 10 scale. Jogging, singles tennis, swimming continuous laps, or bicycling uphill are examples. c Muscle-strengthening activity: Physical activity, including exercise that increases skeletal muscle strength, power, endurance, and mass. It includes strength training, resistance training, and muscular strength and endurance exercises. d Bone-strengthening activity: Physical activity that produces an impact or tension force on bones, which promotes bone growth and strength. Running, jumping rope, and lifting weights are examples. Source: Adapted from U.S. Department of Health and Human Services. 2008 Physical Activity Guidelines for Americans. Washington (DC): U.S. Department of Health and Human Services; 2008. Available at: http://www.health.gov/paguidelines. Accessed August 6, 2015. Light-Intensity Physical Activity and All-Cause Mortality. Purpose . Research demonstrates that moderate-to-vigorous physical activity (MVPA) is associated with a reduced risk of all-cause mortality. Few studies have examined the effects of light-intensity physical activity on mortality. Therefore, the purpose of this study was to examine the association between objectively measured light-intensity physical activity and all-cause mortality risk. Design . Longitudinal. Setting . National Health and Nutrition Examination Survey 2003-2006 with follow-up through December 31, 2011. Subjects . Five thousand five hundred seventy-five U.S. adults. Measures . Participants wore an accelerometer for at least 4 days and completed questionnaires to assess sociodemographics and chronic disease information, with blood samples taken to assess biological markers. Follow-up mortality status was assessed via death certificate data from the National Death Index. Analysis . Cox proportional hazard model. Results . After adjusting for accelerometer-determined MVPA, age, gender, race-ethnicity, cotinine, weight status, poverty level, C-reactive protein, and comorbid illness, for every 60-minute increase in accelerometer-determined light-intensity physical activity, participants had a 16% reduced hazard of all-cause mortality (hazard ratio = .84; 95% confidence interval: .78-.91; p < .001). Conclusion . In this national sample of U.S. adults, light-intensity physical activity was inversely associated with all-cause mortality risk, independent of age, MVPA, and other potential confounders. In addition to MVPA, promotion of light-intensity physical activity is warranted. Interesting study on why some got injuries and others didn't. Within 2 years, about 40% of the runners reported sustaining an injury that was serious enough to require medical attention and another 16% reported minor injuries. Knock on wood, I have never had a running injury and the 2 things they mention are things that have always come naturally to me. Background Running has been critical to human survival. Therefore, the high rate of injuries experienced by modern day runners is puzzling. Landing on the heel, as most modern day shod runners do, results in a distinct vertical impact force that has been shown to be associated with running-related injuries. However, these injury studies were retrospective in nature and do not establish cause and effect. Objective To determine whether runners with high impacts are at greater risk for developing medically diagnosed injuries. Methods 249 female runners underwent a gait analysis to measure vertical instantaneous loading rate, vertical average loading rate (VALR), vertical impact peak (VIP) and peak vertical force. Participants then recorded their mileage and any running-related injuries monthly in a web-based, database programme. Variables were first compared between the entire injured (INJ; n=144) and uninjured (n=105) groups. However, the focus of this study was on those injured runners seeking medical attention (n=103) and those who had never injured (n=21). Results There were no differences between the entire group of injured and uninjured groups. However, all impact-related variables were higher in those with medically diagnosed injuries compared with those who had never been injured. (effect size (ES) 0.4–0.59). When VALR was >66.0 body weight (BW)/s, the odds of being DX_INJ were 2.72 (95% CI 1.0 to 7.4). Impact loading was associated with bony and soft-tissue injuries. Conclusions Vertical average loading rate was lower in female runners classified as ‘never injured’ compared with those who had been injured and sought medical attention. High-intensity 'sprint training' may be gaining popularity at gyms, but if you're new to this form of exercise, the workout could do more harm than good. A study by Canadian and European researchers found signs of stress in the muscle tissues of their non-athlete, untrained subjects after ultra-intense leg and arm cycling exercises. Perhaps more concerning, researchers reported the untrained subjects had a weakened ability to fight off free radicals, molecules that can alter DNA and harm healthy cells. "Our study raises questions about what the right dose and intensity of exercise for the average person really is," said Robert Boushel, the study's senior author and director of the University of British Columbia's School of Kinesiology. "We need to be cautious about supporting sprint training in the general population." The researchers analyzed tissue samples from their test subjects and found that their mitochondria, the powerhouse of cells, were only firing at half-power post-training, reducing their capacity to consume oxygen and their ability to fight off damage from free radicals. High levels of free radicals in the body have been linked to a number of medical conditions, including cancer, premature aging and organ damage. The potential long-term adverse effects of high-intensity sprint training are unknown, but Boushel and other researchers are continuing to study different levels of exercise, measuring the dosing of training against different biomarkers for health. "If you're new to going to the gym, participating in high-intensity 'sprint' classes may increase your performance but might not be healthy for you," said Boushel. Seasoned athletes and those who are well trained have built up antioxidant enzymes in their bodies to protect against free radicals, said Boushel. He recommended beginners start slowly and gradually increase intensity over time, under the supervision of a trained professional or kinesiologist. The study was carried out in a dozen male volunteers in Sweden, all of whom were in good health but self-identified as untrained or only moderately active. The men participated in high-intensity training over the course of two weeks that involved repeated 30-second all-out sprints, followed by rest periods. Intense exercise training is a powerful stimulus that activates mitochondrial biogenesis pathways and thus increases mitochondrial density and oxidative capacity. Moderate levels of reactive oxygen species (ROS) during exercise are considered vital in the adaptive response, but high ROS production is a serious threat to cellular homeostasis. Although biochemical markers of the transition from adaptive to maladaptive ROS stress are lacking, it is likely mediated by redox sensitive enzymes involved in oxidative metabolism. One potential enzyme mediating such redox sensitivity is the citric acid cycle enzyme aconitase. In this study, we examined biopsy specimens of vastus lateralis and triceps brachii in healthy volunteers, together with primary human myotubes. An intense exercise regimen inactivated aconitase by 55–72%, resulting in inhibition of mitochondrial respiration by 50–65%. In the vastus, the mitochondrial dysfunction was compensated for by a 15–72% increase in mitochondrial proteins, whereas H2O2 emission was unchanged. In parallel with the inactivation of aconitase, the intermediary metabolite citrate accumulated and played an integral part in cellular protection against oxidative stress. In contrast, the triceps failed to increase mitochondrial density, and citrate did not accumulate. Instead, mitochondrial H2O2 emission was decreased to 40% of the pretraining levels, together with a 6-fold increase in protein abundance of catalase. In this study, a novel mitochondrial stress response was highlighted where accumulation of citrate acted to preserve the redox status of the cell during periods of intense exercise. Typically, when the recommendations for *exercise* are given, they are given as a minimum of 30 minutes of moderate exercise a day. That is for exercise/activity that is on top of baseline activity and not a recommendation for "all" activity. The above study calculated the issue differently. They included all types of physicals activity, including very low levels of minimum basic baseline activity (like leisure, work, household, etc), that would not have met the criteria of moderate activity as defined by me and all the other health organization listed in my Exercise Guidelines thread. For an activity to be moderate, it needs to be about 4-6 METs. In this study, "Baseline activity, as currently defined, includes all sedentary and light activities (<3 METs)"
A simple leisurely stroll is 2 MET, so strolling for 60 minutes per day is 120 MET minutes, x 5 days is 600 MET minutes per week, which they are saying is the minimum goal and are using as the baseline comparison group. This would not meet the minimum I discuss. So, the comparison is not a fair one of oranges to oranges. Now, that does not make baseline activity worthless as several previous meta-analyses do show an association between 150 min/week of leisure time activity and a significant reduction in disease. So, the current study is still a bit misleading because it's using an extremely low level of total physical activity (600 MET/Minutes) and including low intensity activity in that total as the control/comparison and not being clear on this. The 150 min/week recommendation is still relevant as long as people are aware it's above and beyond their normal light physical activity and activities of daily living. Many years ago, I wrote an article about this issue of exercise, vs activity. In it, I asked the question, which was more important, the hour you spend in the gym doing formal exercise, or just being active all day and getting >/= 10K steps a day. My answer, was both. We need to get the equivalent of at least 30-60 minutes of moderate exercise, at least 5 days a week and we also have to lead an active lifestyle. Perhaps I will add some comments to my exercise thread to clarify this issue, and these distinctions, some more. Copyright (c) 2018 John A. McDougall, M.D., All Rights Reserved.